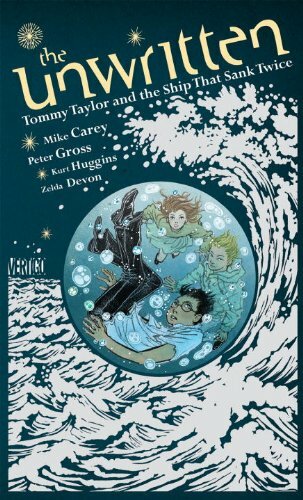 I’ve been reading these Tommy Taylor books long enough to put them on the same level as Mike Carey’s Lucifer, if not quite the pinnacle of Neil Gaiman’s Sandman. Of course, Mike Carey writes The Unwritten series as well, so I suppose that wouldn’t be an exactly shocking comparison. I guess what I mean is that it’s nice to see him spread his wings and tell a literary story that is all his own and that nevertheless aspires to the heights The Sandman achieved. I will, of course, have to go back and reread the series at a gulp, after it’s completed. (That’s probably true of Lucifer, for that matter. The television series is not, uh, a suitable replacement, although it is good trashy fun.) And the place I would inevitably start is with Tommy Taylor and the Ship That Sank Twice, an unexpected prequel that not only details the lengths Tom’s father Wilson went to, establishing the symbiosis between his son and the fictional character based on him (or that he is based on? I don’t think there’s a correct one-way distinction to be had), it actually provides the story of the first Tommy Taylor novel. Which, of necessity, is less of a Harry Potter rip-off than the books have seemed when only shown in snippets in the main sequence of The Unwritten series. Then again, it also hastens to explain that the synergy between character and infant is the cause of the Tommy Taylor series replacing other child wizard academy books as the archetype of the series, so from an in-world perspective, the distinctions were probably a lot less necessary than they were from the perspective of an author and publisher looking to not get sued for plagiarism. Because, as good as the conceit of the series is at letting it get away with the in-world rip-off, I doubt Rowling would much care about a clever conceit. I think I’ve gone off message at this point? It just fascinates me, what Carey has done here. In any case, The Unwritten is a good series, and you should read it! 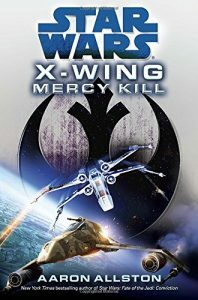 And this is a good prequel, and you should read it too; but like all good prequels, you should read it later, to avoid spoilers for previous books. This entry was posted in Words and tagged fantasy, graphic novel on April 18, 2017 by Chris.